While i was building Voyager i didn't think i would start a new ship this soon after the previous build. However the fact that my uncle was practically drooling over my Voyager has resulted in the situation were he has bought the ship from me, leaving me with no ship of my own and only my pride in the first build. So that is why a couple of days ago i asked the question what would be a good replacement ship for me to build. Mainly because the Voyager was to big to be placed comfortably at my desk and in an other room it would be neglected, something that model did not deserve. 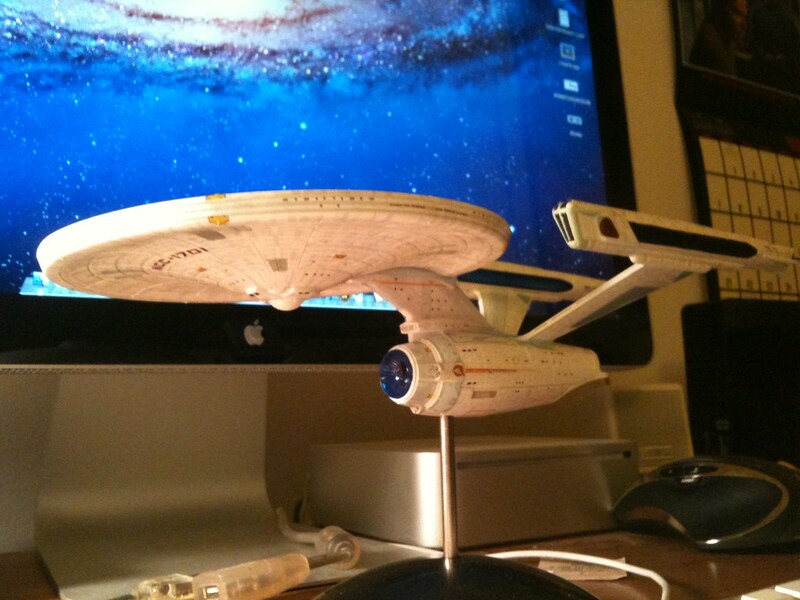 The decision has fallen (with the help of Gadgetron) on the 1:1000 Polar Lights kit of the NCC-1701 Enterprise Refit. Certainly a challenge as i want to light this model in almost all the main features. So navigational and anti collision lights, flood lights, interior lighting of minimal all the windows that are molded in the plastic, the impuls/ warp cristal, impuls engines, warp grills, photon torpedo tubes and not to forget the deflector dish. Wow just typing all that makes me realize that is a lot of led's for such a small ship. Luckily I found that Boyd was doing a diorama of the refit and Reliant in this scale, but unfortunately seems to have put that project on hold, because i can only find 3 video's on that one and he was a long way from being finished in the third video. I guess other projects took priority as i can indeed understand. Luckily also found some other build logs on the forums and youtube, so have some reference material for my build. This is going to be the first time i will use 0805 smd led's and even smaller 0402 as i had ordered two 0402 smd's for Voyager's floodlight but did not realize how small it actually was, so had not ordered a pre wired smd This time around almost all led's will be smd based, so i ordered the pre wired versions with 1K resistors on the led's. This should make keeping the lights in scale manageable. When the parts arrive i will post an update and begin the process of building this kit. As always, any comments or tips for me, don't hesitate to post them as i do enjoy reading them all! Wow. Good luck lighting this small kit! I have been slowly working on this kit (unlighted) for a couple of years now. I had to order a spare set of decals from R2 because the ones I have were shattering on me. The aztec decals don't all seem to be precisely measured as one would hope. 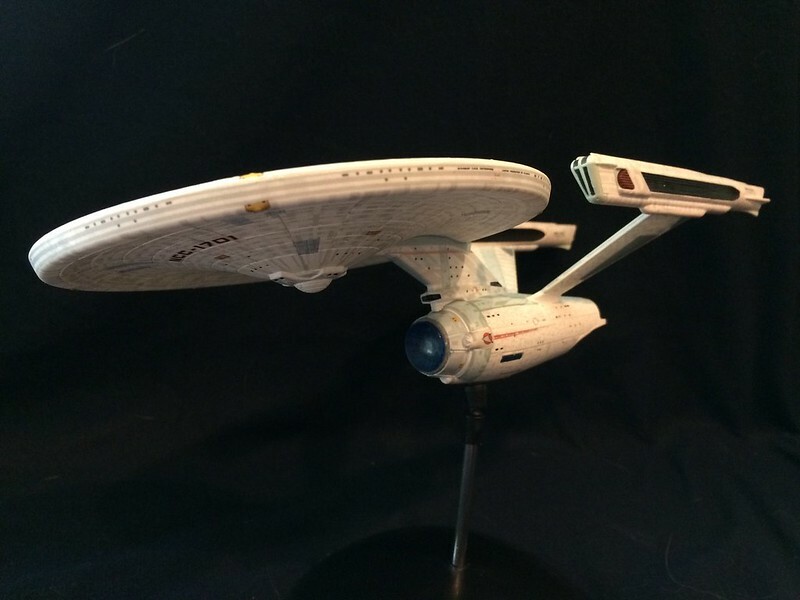 I will soon have a second kit and I think that whenever I get around to building it, I would only light the nacelles, deflector dish, and such. UNFORTUNATELY, Tetryon parts is on indefinite hiatus. I bought their resin replacement for the torpedo bay and it is fantastic. I wish I could have bought more. I have watched your video's as well on Youtube and i have to admit, seeing the trouble you had to go through to install the torpedo bay was giving me second thoughts on some of the thing i want to do. But no i will stick by them for now. As for the lighting, the plan is to do the lot. today or tomorrow will bring the smd's for the NAV, anti collision beacons, floodlgihts, impuls engines and crystal, torpedo tubes and deflector dish. The lighting for the interior and the warp grills i still need to decide what kind of tape i want to use. But for that i think i need to see the model in the flesh first. Also i may end up needing bigger led's for the deflector dish and impuls crystal. Its definitely a shame Tetryon parts is no longer providing the ability for you to get a second torpedo bay. That resin part looked absolutely beautiful. Not that i would take in on to modify the kit in that way. Don't trust myself to bring that to a good result. Be sure to pick up the photo etch set for the Refit, as it includes templates to drill out the windows on the saucer. This is a life saver when lighting this one. Well, I tend to get thumbs down for it, but I have a policy to not hide my mistakes in my videos. The problem I had with the Tetryon torpedo bay part is that I am such a goofball that I made it far more difficult than it should have been. The great thing about the Tetryon torpedo bay is that there is no modification necessary to their part. 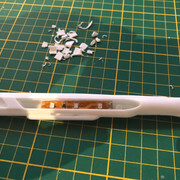 The top of it is supposed to fit into the neck, but I thought that it was the neck itself, so I cut away that part of the model. Crap crap crap. So it's really easier than I made it out to be. The other stupid mistake I made with this kit is that after I had some decals shatter on me, I made the stupid mistake of airbrushing the rest of the decals with Micro Set rather than Micro Decal Bonder. Nuts. The nice thing is that Round2 doesn't charge much for the replacement decals. Last year at the All-Japan Hobby Show, I bought the white plastic runners to this kit. I ordered the clear parts along with two decal sets so that I can finally finish my current project and eventually start another someday... and light it now that I'm becoming more comfortable with that. @greg: I just subbed to your channel. It looks like there's a lot of good stuff there! 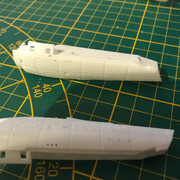 @Cpt-Spekkie: The 1:1000 refit was my very first model. I built it about 5 years ago. I've since built 2 of them, plus have a lit one in progress (and on hold). It's a wonderful kit! It's not too hard to make it look fantastic either. Good luck, and I'll be watching your lighting progress! Wow MattA that one looks so nice! The expected delivery of the model was between today and tomorrow, but for the last two days the tracking information shows it hasn't moved or at least not scanned anymore. So its daubtfull that it will arrive tomorrow, as it still needs to be handed over from the German post to our Dutch postal service. Oh well, just have to wait a little longer i suppose. And as a first for me, i chose to not use the Velleman blinker board to do the strobe lights. This off course because the Enterprise has blinking nav lights unlike the runabout and Voyager. So instead i created a dual 555 timer setup on a small piece of perf board. Made it as flat as possible, so that i can hopefully stow it in the saucer. 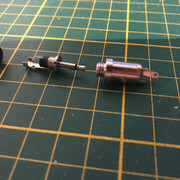 Also got me some magnet fire, (havent used it before, always did everything with utp networking cable) the smd's are pre wired and i wanted to have a little more in case i need more to connect everything up. The white primer and pearlescent white has also arrived. Only the flat clear needs to be ordered, but i will do that once i decide what clear i want specifically. Thanks for the tip of the Photo Etch. I;ve looked but can't really get it for a reasonable price here, or in a quick manner for one thing. So i will try and create my own template for drilling the windows. One thought is to scan the decals (with an size indicator) and then trace the window decals and recreate them in Fusion360, so that i can 3D print a template from them. An other approach would be to measure all by hand and recreate it in Fusion. If this fails, then i will look again and try and get the Photo Etch and put the project on hold for that time. Also question for you MattA, since the decals include the windows in black, what are you planning on doing having drilled out all the windows? Are you planning on cutting the black pieces out of the decals? Or something like, placing the decals and then using a small drill to poke the decal windows out? Really interested in the technique you are using or will be using. I haven't gotten that far on the lit one yet. Odds are that I'll place the decals over the drilled out windows, then drill out the black dots (or just poke them out). If it's done carefully, you'll never know they were there in the first place. Wow, Matt! That's very nice for a first model. I'm having problems with keeping the aztec decals fitting around the edge of the saucer, even with making incisions along the edge and using Tamiya Mark Fit Strong. I've had problems with them flaking. I hope when I put the perimeter decals on, it won't be obvious. My other problem is some air bubbles under the decals. I've poked them and applied the Mark Fit Strong many times. Nuts. Some say the aztecs look too bold, but I like the comic book-type of feel they give. I sprayed mine with Tamiya rattle cans, first with Pure White and then with Pearl White. I really like how it turned out. That is if the model ever arrives. So i can't fault the ebay seller at all, but reading all the negative comments on twitter about Hermes Germany, i get the feeling he should never have used that company in the first place. But oh well. Well with any luck tomorrow will be the day i can finally really start with the build as that is the day i should receive the model kit. The first one seems lost in the mail, as it is still not delivered and the ebay seller was so kind as so send a new package through a different shipping company. If the first one ever arrives i think i will keep that and contact the seller so that i can send him another payment, but only if that one ever arrives. If not it should finds its way back to him, as non deliverable packages are routed back to the sender. But really looking forward to the build of this model. The model did indeed arrive today, so finally i could make a start with unboxing, and getting the last materials i need as i can see for now. 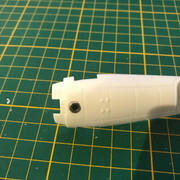 So i also chose a 2.5mm headphone mono jack for the connector to bring in the power for the model. But holy moly this thing is tiny and tight for space. I'm very interested in learning how to transform a headphone jack into a power connector. Well basically a headphone jack and a dc jack are not that different from each other. Also the headphone plug and dc plug that go on the cables are very similar. For my install i chose a mono plug and counter plug setup. So its in essence a 2 wire connector. If you use a stereo connector you get 3 wires. So for setups that would want to attach 3 wires to the model, for instance power, ground and a switch wire, then you could use a stereo setup. or even a 4 wire plug if needed. But those will result in bigger connectors that need to be installed in the ship. So thats why i went with the basic mono version. I only need power and ground as all the electronics will be in the model. As you can see on the picture, the cable plug end has 2 tabs (same as a dc plug) and also the same as by a dc plug, the shorter one it for normally the positive wire of a speaker and the longer one for the ground. In our setup this means that the shorter tab is connected to the front portion of the stem that goes into the socket. The longer tab is then connected to the back portion of the stem. On the counter (panel side) model side of the connection, we see 3 tabs. The two shorter once are in my case color coded, one is koper color and one silver. The silver corresponds to the positive and the coper to the ground. The longer tab also reads as a ground. So when i plug both connectors together as they would be when the model is plugged into the pole and i use a multimeter to test for continuity, i get a connection from the shorter tab to the silver tab, and from the longer tab to both the longer and the koper colored tabs. This means that i may choose which of the ground tabs i want to use inside my model and also i only need to connect the 2 tabs inside the model. So one tab will remain unused. Hopefully this brings some insight in how to use a headphone plug and socket for power. On a sidenote, here is my progress so far. 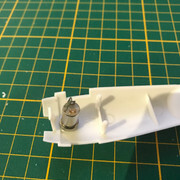 I drilled out all the molded windows of all the parts, modified the nacelles so that the led strip can be glues to the outside nacelle wall, so that i get a little bit more room for the light to blend and be defused. (Also i will be replacing the transparant nacelle grills with my own designed and 3D printed inserts. Not that i planned this, but i unfortunately snapped one in half when trying to dry fit the model So will have to print a replacement part for myself. And think i'm going to substitute both for translucent blue 3D printed inserts. More on this when i have designed them and printed tem out. Also the windows in the rim of the saucer, because i don't have the photo etch, i thought of making my own template, well wat i ended up doing was i made a copy of the decal sheet and used the printed out paper version of the window sections to temp stick them with scotch tape to the rim and drill out the windows. Well that was a big mistake. As always i welcome any comments, questions and suggestions. Tomorrow (Sunday) will consist of light blocking the inside, and hopefully gluing in the led lights.